Whether you’re heading home after a fantastic holiday abroad, are returning from a business trip or are just visiting to collect someone else there’s always the risk of going back to your car at the airport to realise that you have no idea where your keys are. That’s why we offer car key replacement at Stansted Airport. 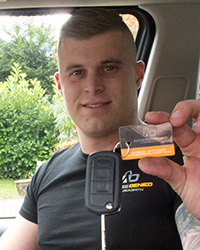 At Access Denied we understand the different circumstances surrounding a lost or misplaced key, and that’s why we work hard to ensure you’re presented with a car key as soon as possible. Finding yourself stranded at the airport isn’t pleasant, but it’s also not uncommon. In fact, a lot of people return home only to find they haven’t seen their car key in a few days and have no idea where it could be. If you lose or misplace a key, it’s best to seek the help of professionals. Today’s car keys are extremely high tech and each make is different, which means replacing them isn’t as easy as it used to be. Now, it’s important that professional locksmiths do the job. All of our Access Denied locksmiths stock everything needed to create a car key replacement for almost all vehicles including parts that cater to immobilisers, central locking and auto lock features. So, whether you have a common car or one that’s a little more unusual, we’re able to provide a key replacement. As a mobile car key cutting service, we’re able to offer car key replacement at Stansted Airport. Our state of the art facilities and modern technologies allow us to offer a mobile service, meaning we’re able to travel to wherever you are. Our car key replacement service is available 24 hours a day, 7 days a week. This means you never need to worry about losing your keys, as we’ll be there to save the day in a matter of minutes. Finding yourself with a lost car key can be stressful, but remember that help is only moments away. Simply contact Access Denied, let us know your location and wait for an expert to arrive. With our mobile setup, there’s no need for you to travel anywhere. What could be easier? We’ve all had the instant worry when we can’t find the car keys in our pocket or at the bottom of our bag, only to realise we were looking in the wrong place. But, what happens when a car key is missing for real? Regardless of how careful you are, it’s extremely easy to misplace and lose a car key; it’s also equally easy to lock the keys inside the car, whilst locking yourself out. In these situations you will require the assistance of a professional locksmith. There could be a tonne of different reasons as to why you need an auto locksmith in Stansted Airport; perhaps you’ve returned home from a family trip away and realise you’ve left your keys elsewhere or maybe you’re back from a business trip and find the keys are locked inside the car. Whatever the problem, Access Denied are able to help. Our team of experienced and knowledgeable auto locksmiths are on hand to help with any emergencies you may face, such as lost car keys or keys locked inside the car. By offering all of our services 24 hours a day and 7 days a week, we ensure we’re available for whenever you need us. After all, more often than not, keys go missing at an inconvenient time. As Access Denied is a mobile service, our team members are able to travel to wherever you are. Whether you’re stuck in a car park or elsewhere, it won’t take us long to reach you. In fact, we guarantee a service that’s quick and efficient. We work hard to ensure you’re not left without access to your car for longer than necessary. Within no time you’ll have a brand new key, access to the car and you’ll be back on the road. Thanks to our state of the art equipment and fully equipped vehicles, we’re able to offer a wide range of services. These include cutting new keys, fixing faulty locks, gaining access to a car and programming transponder keys. Even with the most advanced key and lock combinations, we’ll fix the problem. In the past, getting a replacement car key was really easy and gaining access to a locked car without a key didn’t take too long. However, with advancing technology and a greater awareness of keeping vehicles safe, this is no longer the case. Though this is good news for keeping parked cars secure, it makes things a bit more difficult when it comes to losing keys. Today’s cars have a range of components that need to be taken into consideration, such as immobilisers and central locking functions. That is why it’s important to seek the help of professionals when you find yourself unable to access your car. It’s not uncommon to lose a key whilst on holiday, which is why we act as a car locksmith in Stansted Airport. We offer car key replacement for all makes of vehicles and most models, even the lesser known cars. We understand that there aren’t too many things more annoying than returning from a trip to find you’re missing a car key and the rush to get home has suddenly been halted. Nor are there many things more stressful than having a flight to catch and accidentally locking the car key inside the car, along with your luggage. That’s why it’s vital to have a team of professional auto locksmiths nearby to ensure the problem is resolved as soon as possible. If you need a car locksmith in Stansted Airport, contact Access Denied. We offer an average response time of 30 minutes, no extra call out charges and we promise the very best prices to our customers. Plus, we’re available 24/7. This means you can call on us for help any day and any time. Regardless of whether it’s the middle of the night or first thing on a Sunday morning, a member of the Access Denied team will be with you in no time. There’s no need to worry about a lost key or finding a replacement key when you choose Access Denied. Simply, we work hard to fix the problem in record time. Though you may assume that you’re not the type of person who would accidentally lock their keys in the car, that’s what everyone who ends up doing it thinks as well. The fact of the matter is that it’s extremely easy for keys to become locked in a car and a lot of people do it. However, do you know what to do if it happens to you? If you’re at Stansted Airport, the chances are you’re on a strict time schedule and you have somewhere to be; that could be catching a flight or rushing home to unpack. Either way, it’s important that the car is opened and the key is retrieved as soon as possible. It may be tempting to try and gain access to the car yourself, by picking the lock or sliding the window open, but this usually does more harm than good. Opening a car lock without the key is a difficult procedure and it requires a considerable amount of training in order to make sure no damage is done to the vehicle. That’s why it’s important to seek the help of professional auto locksmiths. A professional auto locksmith will be able to gain access to the car quickly and without causing any damage, even with the keys locked inside. If you find yourself with keys locked in the car at Stansted Airport, contact Access Denied. With a team of highly trained professionals, we’re able to gain access to the car in no time. We understand that locking keys inside the car is a huge problem and leaves you with very few options until help arrives, which is why we work quickly and efficiently. Our mobile setup means we can travel to you with ease so whether your keys are locked in the car at Stansted Airport or elsewhere, we’re able to help. All of our work at Access Denied is covered by insurance and is guaranteed to be the high quality work you expect from a professional company, so you can rest assured knowing you will be receiving a top service. Very good , quick, friendly, much better than anyone else I phoned. Considering my girlfriend lost keys at Stansted Airport , it was a very quick turnaround otherwise we would have been stranded .